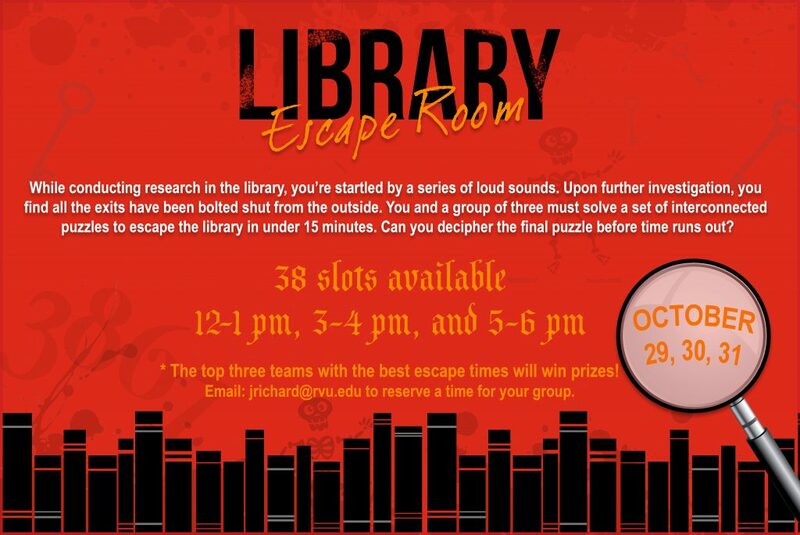 This Halloween, students, faculty and staff can put their problem solving skills to the test as they attempt to Escape the Library! Groups of four will follow a unique storyline and works as a team to solve a series of interconnected puzzles to reach the final, secret phase. There are open slots for groups of four for October 29th, 30th, and 31st. The three teams with the best escape times will win prizes! To reserve a time for your group on the Colorado Campus, email jrichard@rvu.edu. To reserve a spot on the Southern Utah Campus, email lstephenson@rvu.edu.